It is no secret I love to read. It is also no secret I am cheap thrifty. Combining these two things makes the public library my best friend. I love the library. I love using it personally and for the kids. Today I thought it might be fun to discuss five ways to make sure you’re fully utilizing your local public library. Check out ALL the libraries in your area. Depending on the size of your area, you may have access to more than one library. Check out all the different libraries in your area (many even have programs that allow you to check out books from any location). Every library is different and you may find you want to utilize different branches for different purposes or activities. We do! Do they allow you to reserve items online? Who says all of your online shopping as to be done at Amazon? Before I purchase a book, I always go online to see if my local library network has a copy. Many libraries do a “share” program with nearby libraries, so you have access to a wider variety of materials. You can reserve online and pick up your nearest location. Did you know that many public libraries also offer check out services for your Kindles and other eReaders? Don’t forget to check if your library offers this service! Programs & activities at the Library. Libraries are jam packed with some awesome programs. From story times, to book clubs, to community speakers. 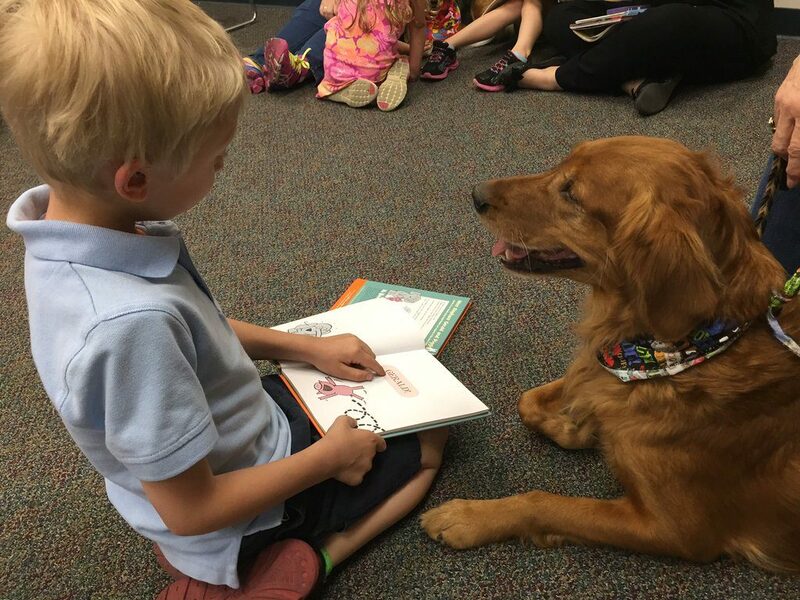 One of our recent family faves was a program offered to allow children to read to dogs. My reluctant first grade reader loved it! And best of all, most of these programs are free! Every town has a library. If you are going on a trip or vacation and have a little extra time, don’t forget to check out the local library in the city you are visiting. It might be fun to just go sit in a comfy chair and read a little. (It’s also a great thing to do with kids when you have an hour to kill). Also make sure to check out their program schedule. There might be something interesting happening during your stay. Sometimes we get so bogged down in our daily activities and to-do lists that we think of reading as a luxury we just don’t have time for. Reading is an essential part of life. It allows us time to relax, think, dream, escape, and learn. Take time to read today and take time to allow your local public library to be the key that unlocks the imagination within you.